My life is crazy. Between schooling four kids, working for the Schoolhouse Review Crew, church, activities, (and did I mention work???) I just always seem to come to the end of the day realizing that I never once thought about dinner. I was absolutely thrilled when I found out that one of the reviews this year was going to be for MyFreezEasy. Thrilled. At other points in life, I have used freezer meal prep to make it so that we do actually get dinner at night, but that always required a long day in the kitchen and a whole lot of planning. 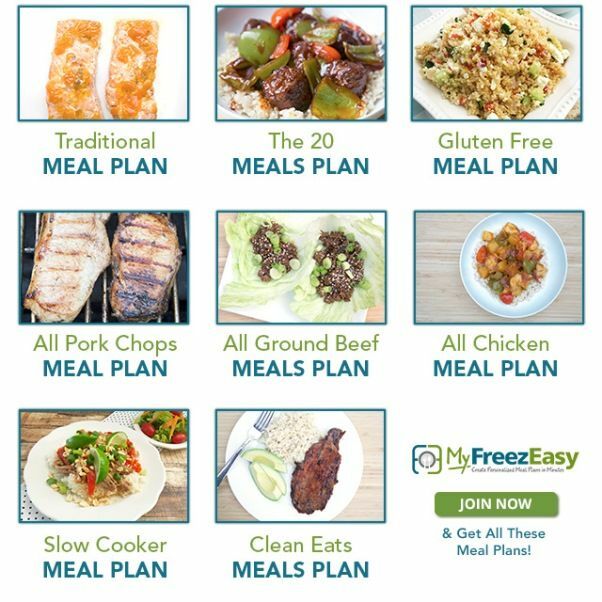 With the MyFreezEasy.com Freezer Meal Plan Membership, though, it really, truly is EASY. We came home from church today and everyone was STARVING. You know those days, right? Well, I had pulled out the Frito Pie bag a couple of days ago. That meant I dumped the bag into a skillet to warm up, split up the Fritos, and started topping them with the meat mixture, cheese and sour cream. By the time everyone (but me) changed clothes, lunch was served. And everyone loved it. That is something I can get used to. For most meals, you don't cook the meat (most of the ground beef meals do involve browning the meat first) and most meals are put into zipper bags. Everything is all together, so when you want to serve a meal, you thaw it and cook it. Most of the prep work is complete, though you may need to add an ingredient or two. Right now, we have a lot of chicken in our freezer. We butchered a couple dozen, plus I already had a fair amount frozen. Thawing chicken in order to add ingredients and refreeze it doesn't sound like a great plan, so I chose to do the All Ground Beef Menu Plan. I looked at the August Menu and the September Menu, and ended up doing both. That's 20 meals, allegedly for my freezer. Didn't turn out that way, as we ate one meal the first day we prepared meals, and we ate another meal on our second day of preparing meals. Eighteen meals in the freezer isn't bad either, though. Contents, which lists out the recipe titles. 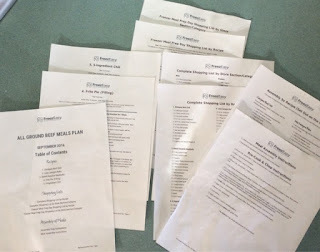 The actual recipes (most plans include five recipes, and you make two meals of each). Various shopping lists, including options for purchasing everything or purchasing just what you need on the meal prep day, and including options for by recipe or by store section. As a family of six, including two adults, two teen boys, an almost-teen boy, and a tween girl, a meal meant for four people isn't going to cut it. So I actually ended up taking each individual recipe multiplied by three, and then splitting it between two bags for the freezer. That gives us six servings per bag, and so far, that has been pretty much spot on. We even have leftovers occasionally. With the Premium Annual Membership, you can create your own meal plan, and that gives you the option to adjust the serving size. I wanted to try this with just the plans as outlined by the program, and that did work quite well. To prepare the meals, I had William cook the ground beef for each recipe, while I assembled the other ingredients for the bag. We had a really good system going there, as I would usually finish getting everything else together just in time for him to split the browned meat between the two bags. 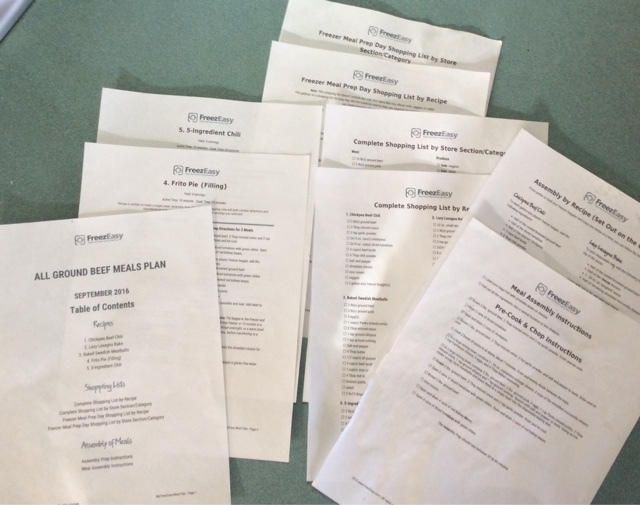 We chose to make five meals one day, and five the next, and we did a mix-and-match from the two month's plans each day. My plan right now is to watch for pork chops to go on sale, and then to do up a month or two (or three!) of meals there too. October's Pork plan sounds wonderful, with meals like Cornbread Pork Chop Casserole, Asian Orange Pineapple Pork Chops, Cashew Parmesan Pork Chops, Apple Juice Brined Pork Chops, and Slow Cooker Pork Roast with Sauerkraut. 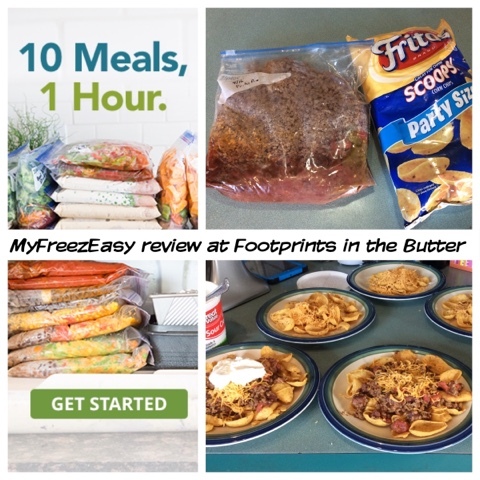 The Crew loved MyFreezEasy, so you should go check out their reviews! Lots of great photos to make you hungry. Great review. Everyone seems to be raving about the Frito Pie. I can't wait to try this one once I can eat normally again!